To put it simply, collections are a bit like playlists. You may also liken them to ‘bins’ in edit-speak. Clips can exist in multiple collections, and each collection represents a group of different clips which belong together, in some way. You can build collections according to any criteria; from &apos;favourites&apos;, to sequence selects, to B roll highlights and character sub-stories. The sky is the limit here - you can make as many collections as you like. A collection management window will will reveal itself. From here you can see all the pre-existing collections in the project, with the option to create a new one via the &apos;Add a collection&apos; button. The boxes next to the listed collections indicate how your selected clips appear in that collection. tick box indicates that all of your selected clips appear in that collection. You can click on any of these boxes to quickly add or remove your selection. You must then click on the &apos;Save changes&apos; button to complete your action. To access any collection, click on the Collections drop-down in the filter on the right-hand side of the page. Once you select your collection the page will reload to show only the clips in that collection. Should you wish to change the name of a collection you&apos;ve built, you can do this by clicking on the blue pencil button at the top right of the page. You can also add a summary for this collection. 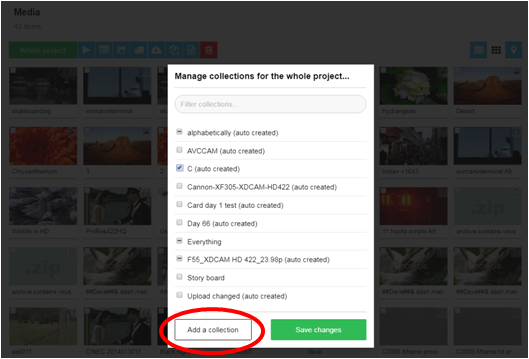 You can delete the Collection as a whole by clicking on the red trash can icon, located in the top right, next to the ‘Upload footage’ button. This deletes the collection but the media remains on the project. Important : If you use the red trashcan/delete button, located next to the blue function icons, this will delete any media selected from the project. Check out this link to see how to create the perfect running order to share with the world.